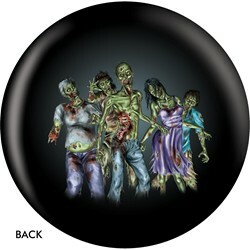 The front Image of this ball depicts a creepy zombie but beware, the back features a zombie horde! Take this ball to the alley and stand out with this unique design. Due to the time it takes to produce the OnTheBallBowling Zombie Horde ball it will ship in 1-2 weeks. We cannot ship this ball outside the United States.